".... the only thing is there's no kitchen...." said the organiser of the event (he had been at the hog roast we had served at Basepoint in Tewkesbury last year). After cooking in all manner of locations over the years, this was not a problem, just a challenge. 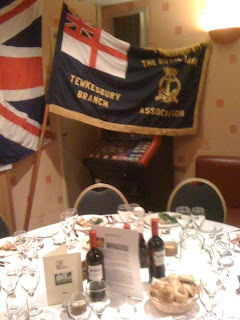 So the evening before the royal wedding we converted the back room (above) of the Royal British Legion Club (who are also tied in with the Naval Association) from a bar room to a make-shift kitchen. No cooking facilities of course, so it was just a matter of choosing the right menu which could be served up without need of a cooker. Mind your head though - this is a 1500's building so very low oak beams. This had to be the second closest event we had done (the first being the hog roast a couple of units down from us), which greatly helped the logistics. I cooked the salmon absolutely at the last minute while Hannah and Ethan took the first load of equipment to the venue. Cooking it so close to the time means it stays fresh and moist once cooked. Put it in the fridge and it goes hard and dense - makes such a difference as we found out on the night. Jersey royals are mixed with mayo and spring onions, hiding under the salad with fennel, radish and orange. Main course - well, so fast we forgot a photo. But rave reviews were coming back before they had even finished. Brisket of Home Farm (about 5 miles from venue) Hereford beef cooked in Cotswold Way ale with new potatoes, french beans and red onions and chantenay carrots. The beef had been cooking for 10 hours on 160 oC the day before. This meant it could be sliced cold at the venue and re-heated in the chafing dishes as could the veg which had been pre-cooked in the afternoon. The chafing dishes are more powerful than you think - light them early and rather than just keeping things warm they can actually warm them up. I took the temperature probe along as well, and was able to give the dishes a helping hand on the top of the mini baby belling electric oven we took along (handy bit of kit). Searching for a dessert I came accross this amazing recipe which had great reviews. It also gained amazing reviews from the guests that night too. It's like combining 2 all time favourite rhubarb desserts in one. I also added rosewater to the custard and used my trusty pastry recipe (link here) for the pastry cases. One of the comments underneath the recipe had suggested adding almonds to the topping as well which I did - a nice addition, and also bulks up the topping so it is enough. It makes such a difference when things are homemade it seems - this tart had been a labour of love that afternoon, and came out of the oven just in time for the salmon to go in. But the amount of work paid off when we had so many happy diners. The one pictured above was the last piece, pictured after all the others (better looking versions) had been served. This one went to the couple who run the bar. As my house is virtually opposite the venue we were able to use the oven there for the pies while the guests were eating the main course. In fact some of the rhubarb used actually came from the garden, so about 200 yards ish - that's locally sourced ingredients. the menu on the list sounds yumm!! It's a great opportunity to cater food for the Royal Naval Association Anniversary Dinner. It will probably be one of your best experiences.